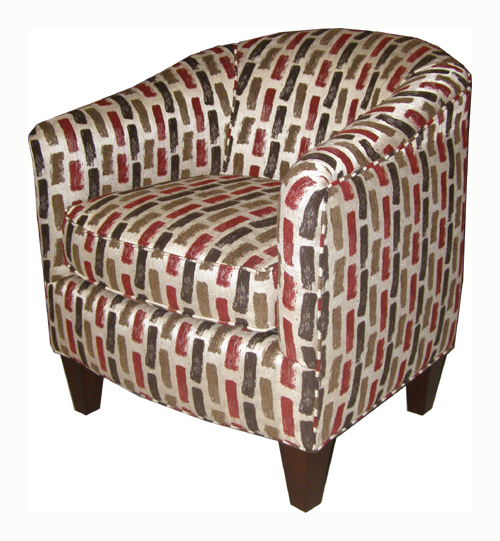 Looking for a modern accent chair that offers comfort with a contemporary flair? The Keely chair is a shaped tub chair with a reversible cushion and tapered dark wood legs. This chair is sure to compliment and room. Select your favorite fabric and have it in your home in 30 days or less.” Back construction is webbing and the seat construction is sinuous wire. Back cushion is block foam with polyester fiber cap. Cushion is block foam with polyester fiber wrap. Legs are 5 in. tapered wood screw-in with dark brown finish. Welt is matching. *Fabric shown has been discontinued. Other special order fabrics are available.